Ultimately, technology is all about people. As a leader in middleware software infrastructure, TIBCO recognized that in spite of their success in solving highly complex customer issues, this message was not reaching potential customers. TIBCO approached us to develop a content-rich Customer section for their website, in order to better communicate their intense focus on solving customers’ enterprise challenges. It was more about having a consumer-oriented focus and it was a new approach. We shifted the discussion from technology to benefits and from software to people. The benefits-driven approach resulted in a content-rich customer section, including 109 Customer Success Stories, 70 videos and approximately 150 content pages from customers worldwide. 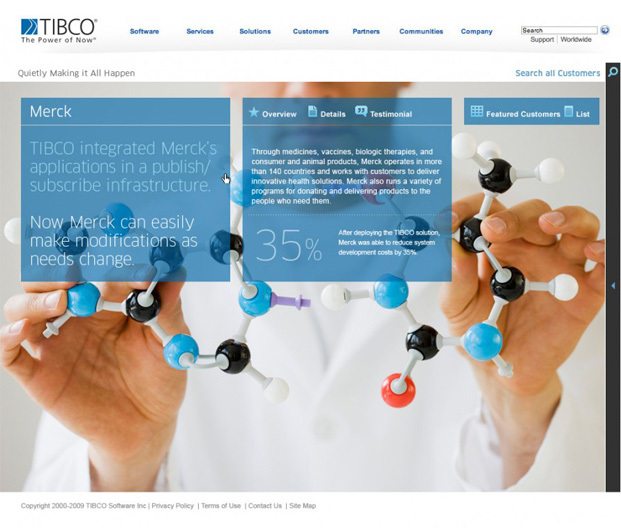 Our approach utilized the customer’s end user to tell the TIBCO story and create an engaging user experience. And engagement is what it’s all about.